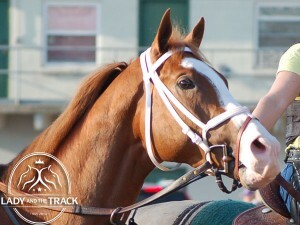 Will Take Charge will break from post position #3 with 12/1 odds in the 2013 Jim Dandy Stakes at Saratoga Race Course. Jim Dandy Stakes 2013; Bashaar Beginner’s Pick: Saratoga Race Course is full of talent this weekend as 2013 Triple Crown contenders prepare for the Jim Dandy Stakes on Saturday, July 27th in Saratoga Springs, New York. Fashionable fans will flock to see the 2013 Belmont Stakes winner Palace Malice, with 5/2 odds, take on Freedom Child who finished 13th in the Belmont Stakes, Mylute, who finished 3rd in the Preakness Stakes, and Bashaar, who is our beginner’s pick this week. 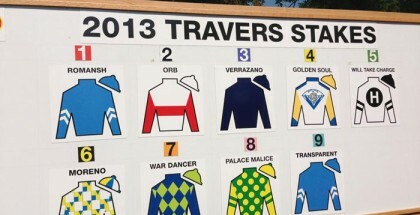 A total of ten three-year-olds will compete in the $1 million 1 1/8 mile Jim Dandy race which will weed out possible Travers Stakes contenders. Palace Malice highlights the Jim Dandy Stakes field with jockey Mike Smith and will break from post position #5. Mike Smith has won the Jim Dandy Stakes in 1990 aboard Chief Honcho and again with Awesome Again in 1997. While wearing blinkers, Palace Malice finished 13th in the 2013 Kentucky Derby but proved himself in the Belmont Stakes by beating out Preakness winner Oxbow by 3 ¼ lengths. Owned by Dogwood Stable and trained by Todd Pletcher, Palace Malice has already earned over $870,000 in his career by winning two races out of eight. 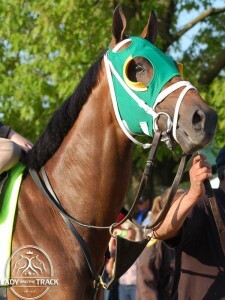 Experts like Palace Malice and have described him as a “turn key” horse. He knows what’s expected of him and performs better and better each race. Palace Malice and Mike Smith are the favorite with 5/2 odds in the 2013 Jim Dandy Stakes. Bob Baffert’s Code West is definitely on my radar for the 2013 Jim Dandy Stakes. 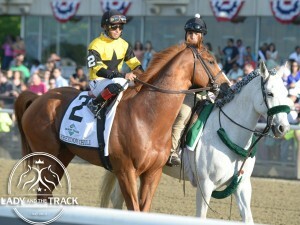 Code West finished first in his last two races and will team up with Joel Rosario on Saturday. The duo will break from post position #2 with 6/1 odds. I like trainer Bob Baffert’s steady approach with Code West. The Gary and Mary West owned horse’s record indicates a constant incline, which makes me think he’ll end up in the money on Saturday. Mylute is another one of those horses that I really want to win but never comes in for me. I always change my mind last minute and put money down on Mylute. The experts like the way Mylute has been training recently and suggest the colt will do well in the 2013 Jim Dandy Stakes. 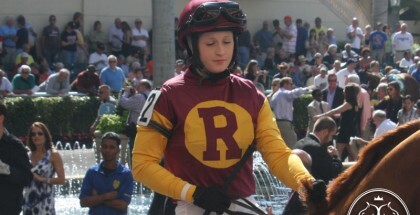 Rosie Napravnik will lead Mylute to the finish line with 7/2 odds. 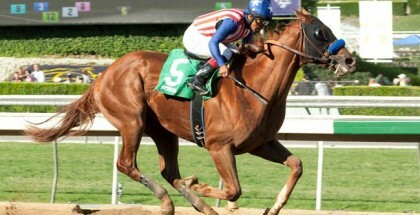 I honestly feel like Rosie is strong and fights to the finish but think a jockey change may be best for Mylute. Another expert favorite is Freedom Child. Freedom Child will break from the 7th post position with one of my favorite jockeys, Luis Saez. I like freedom Child but he’s too unpredictable for me to spend my champagne money on. The Thomas Albertrani trained three-year-old finished 13th in the Belmont Stakes but 1st in the Peter Pan Stakes just a few weeks prior. Before that he finished 10th in the Woodford Memorial Stakes at Aqueduct but finished 1st at Gulfstream Park earlier in the year. Freedom Child is all over the map. Experts like Freedom Child with 4/1 odds in the 2013 Jim Dandy Stakes. There are several other contenders in the 2013 Jim Dandy Stakes worth mentioning but I’d like to bring Bashaar to your attention. Bashaar is trained by Daniel Peitz and owned by Shadwell Stable. Bashaar has won two out of seven races this year with unimpressive stats. Our “beginner at the track” has picked Bashaar to win the 2013 Jim Dandy Stakes. With 15/1 odds, Bashaar may be a good bet for you too seeing how our “beginner at the track” is on a four-win hot streak! In related news, Stephanie’s Kitten will break from post position #2 with jockey John Velazquez with 8/5 odds in the Diana Stakes. The 2013 Diana Stakes is the 9th race at Saratoga immediately before the Jim Dandy Stakes. Stephanie’s Kitten is a force to be reckoned with! The four-year-old filly is definitely our pick for the Diana Stakes. Lady and The Track would like to wish all of the contenders in the 2013 Jim Dansy Stakes the best of luck. Good Luck! Safe Run! The Jim Dandy Stakes is the 10th race of the day with a 5:45 PM EDT post time. 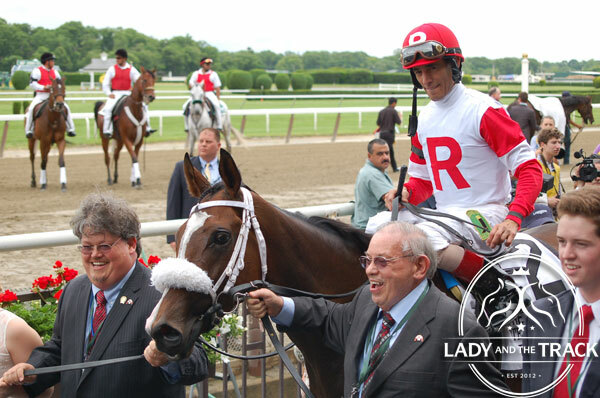 Stephanie’s Kitten and jockey John Velazquez heading to the winner’s circle at Belmont Park on June 8, 2013 with the always smiling Ken Ramsey.